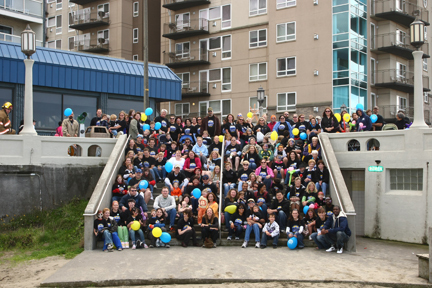 A recent Buddy Walk at the Beach, with participants gathering for a photo at the Prom in Seaside. Every September the good people behind the North Coast Down Syndrome Network call on friends and family to pull off the Buddy Walk at the Beach in Seaside. This year, we have the pleasure of helping them enlist sponsors for the event, which serves as the Nehalem-based nonprofit group’s primary fundraiser. NCDSN uses the money it generates through the Buddy Walk to benefit special needs individuals and their families throughout the Columbia Pacific region. To be a sponsor for this year’s Buddy Walk, contact us or contact NCDSN. Posted by rockyintertidalcocreative on February 29, 2012 in Uncategorized.